This 8 x 6 tongue and groove apex windowless shed is a real quality building. One of the key benefits is the windowless aspect. 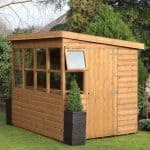 This makes for a shed that is naturally secure against thieves and is therefore useful for anyone who stores valuable tools and equipment. 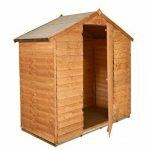 With a large and satisfyingly heavy single door, the shed is very practical. It also meets the sustainable code requirements, so property developers can easily include it in their projects. This 8×6 storage shed comes with an apex roof. The apex style roof is the most common type featured on the majority of modern sheds. This is largely thanks to its water-resistant capabilities. The upside down V-shape roof ensures rainwater runs down and off the shed without settling. Other benefits of this style of roof include maximum interior headspace and an attractive design. In height the roof measures 1.98m, while the eaves total 1.57m. The roof is also protected against debris and rain water with heavy duty sand felt. The shed also measures 2.37m in depth, 5’8” in width and the door measures 0.96m in width and 1.68m in height. It is an average size building offering plenty of space for gardening essentials. 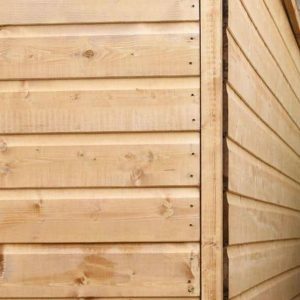 Tongue and groove cladding is used to give the shed a durable, tough construction. Whilst it isn’t as luxurious as Shiplap cladding, it is still a higher quality than overlap cladding. This explains the slightly higher cost compared to overlap sheds. It basically provides an overall solid structure that is more water-tight and reliable than overlap cladding. It has been designed to withstand wear and tear and even provides added security. The panels on this shed measure 12mm thick, providing an ultra-durable finish. Another thing to know about tongue and groove cladding is that it benefits from an expansion gap. 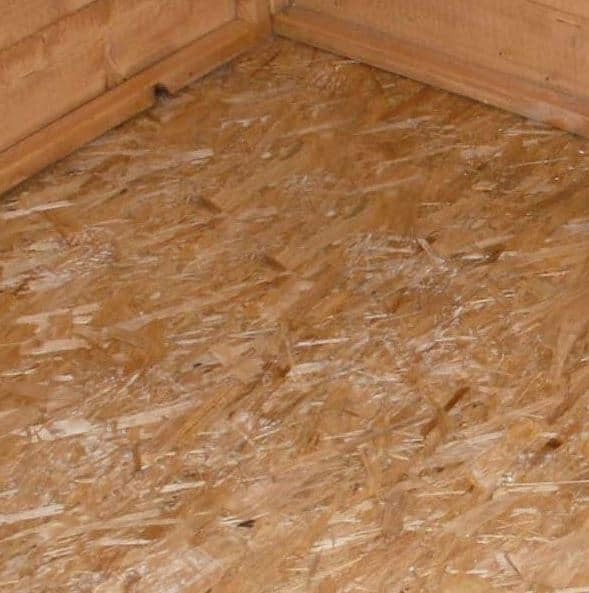 When wooden panels are exposed to changes in moisture or temperature, they can expand. Without an expansion gap this could cause problems for the structure of the shed. Like most sheds in the Waltons range, this one comes with 28mm x 28mm framing. The floor is also made from 10mm solid sheet materials. Now this isn’t the sturdiest of materials so it is advised that you either invest in the extra strength floor support pack or ensure you only store lightweight items in the shed. The good news is, the tongue and groove cladding is sturdy enough to hold the weight of shelving. So there’s the potential to add additional storage space if needed. While the 10 year anti-rot guarantee is an impressive feature of the shed, there are terms and conditions attached. It is disappointing to see that the manufacturer hasn’t provided clear information on the warranty and its treatment requirements. 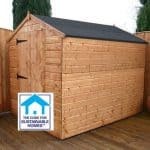 If you want to ensure that you are properly protected, you will need to treat the shed as soon as it has been assembled. You then need to treat it on a yearly basis according to the treatment manufacturer’s instructions. This not only takes up additional time, but it adds to the cost of the shed too. So it is definitely something you need to consider. The shed comes with a single door that has quite a wide design. This makes it easy to transfer items in and out of the building without bumping your elbows or getting stuck in the doorway. It also benefits from having no windows. This is a great privacy feature as you can basically store anything you want in the shed without others being able to see inside. Of course, this does mean there is no lighting which isn’t a major problem, but it will be an issue if you want to work in the shed on long, dark winter nights. The security and privacy of this shed really can’t be faulted. It already comes equipped with security features such as the tough tongue and groove cladding, windowless design and standard RIM lock. However, it is the additional lock upgrades that provide the best security. They do come at an additional cost, but there is a lock type to suit everyone. Waltons state that this shed is fully customisable. This means you can choose whether to include windows, double or single doors, the locks can be upgraded and you can choose the felt type. You will need to contact the company to alter the design and be aware that if you do make changes it could bump up the cost. 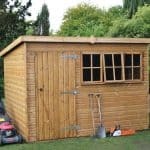 If you want to improve the shed without spending a fortune on customisation, you can invest in the affordable extras instead. The 8×6 Portabase is especially worth investing in as it gives you a solid, level surface to assemble the shed. It also lifts it off the floor which helps to prevent any potential water damage. 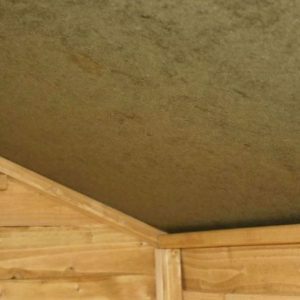 You can also upgrade the felt on the roof to a superior, rather than heavy duty type. The one thing that you can always count on with Walton’s sheds is that they are designed with extremely high quality in mind. This is no exception so we are more than happy to give it a 10 out of 10 rating. The tongue and groove cladding will last a long time, but it does require annual treatments. Without the treatments its longevity is decreased dramatically. 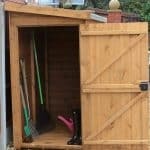 This is an average sized shed so it isn’t going to give you masses of storage space. However, if you only have basic storage needs then you should find plenty of room available. There is also the option to install shelving which will provide further storage space. You will be pleased to know this shed is pretty simple to assemble. The only reasons we have given it a 7.7 out of 10 rating is because the installation requires 2 people, it takes at least a few hours to put together and the installation of the solid sheet materials is a little more difficult than sheds which come with cladded floors. 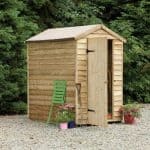 For its size, this shed offers great value for money. We would have given it a higher rating if it didn’t require regular treatments. Final Thoughts: This shed benefits from a solid overall construction. It’s a fairly simplistic model and that is reflected in the price. However, it provides excellent value for money and its average size makes it suitable for most homes. The tongue and groove cladding is a great feature, though the solid sheet materials could be improved to give it more strength to hold heavier items. If you’re looking for a simple storage space then this is a great model to consider.